‘The Way We Do It Here’ is a statement that clearly communicates what you and your business stand for. 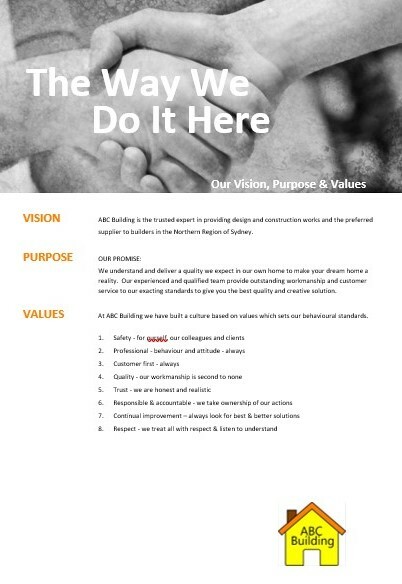 ‘The Way We Do It Here’ relates to your values, beliefs and purpose and to your overall business vision. This statement captures the unseen, the intangible. It is who you are; it is in your blood and your operating DNA. This is how everyone associated with the business must operate. This statement describes how the business ticks, and it dictates daily habits and rhythm. It dictates where you choose to spend your time. ‘The Way We Do It Here’ is non negotiable. It is my 100% firm belief and passion that, to create a business of true value and meaning, one that dominates the market, serving the owners and delivering great lifestyle rewards, you must nail ‘The Way We Do It Here’. This is the desired culture for your business. Put simply, this states, ‘If you want to be associated with our company, this is how we roll, period’. This applies to everyone, including owners, service partners, team members, clients and suppliers. Knowing ‘The Way We Do It Here’ articulates what your business really stands for and why your entire team must bring their ‘A-Game’ and be accountable in taking ownership of all situations AND why your business is different from every other business navigating the same landscape. If you do NOT know ‘The Way We Do It Here’ you will be struggling to attract and retain great talent and customers due to their failure to consistently deliver on promise. Your number one priority as a business leader is to attract great team members, great support partners, great customers and great suppliers. To consistently attract great, you must understand why it is you do what you do. This statement is not about personality or emotion, it is about belief, heart and soul. So, how do you create your ‘The Way We Do It Here’. Your values are you, your heart and soul. They are your moral compass. Your values will drive everyday behaviours. Your values will dictate all decision-making for every team member. Your values clearly state expectations for all to follow – no exceptions, including the owner. Your purpose is why the business exists. Your purpose relates to the value you deliver to your defined market and client, and is your promise to the customer. Your promise states your intentions, providing your client with clear expectations. This is big, because in effect this becomes your guarantee. The team must deliver this promise. The team must own this promise. Teams that buy into the purpose are driven to deliver the customer promise – no matter what. Whether you aim high or aim low, you will be investing blood, sweat and tears. The only difference is where you focus. With a low aim, you are focused on activity, not direction. With a high aim, you are focused on productivity and clear direction. Often the same time is invested, the same money is invested and the same risk exposure is undertaken. Make it big, make a statement, make it a challenge, and have a massive go. An example of a vision is ‘Be known as the industry experts and leaders – the key people of influence shaping how the industry operates. Once you’ve determined ‘The Way We Do It Here’, you need to create your symbol to reinforce your belief daily. Your symbol could be a poster on your wall or a laminated A4 piece of paper as well as a photograph on each smartphone. The symbol needs to be used at tool box talks to share stories, both good and bad. Stories help individuals learn, bringing your desired culture to life. Your symbol should be the most worn out piece of paper in the business, used to ensure everyone is on the right bus.When everyone is playing the same game, following the same rules, it becomes fun. It is always easy when everyone is doing it – this way, it becomes non-negotiable.